For more news and interviews, go to Sue's / John's André Rieu fans Harmony Parlor fan web site. Click HERE. Sonja’s dormant Translations web site (2002 - 2008) contains more information. Click HERE. The Maastricht webcams. Hotel DuCasque replaced the aging webcam in July 2014. Please click HERE to see the images of the new high quality webcam facing the Vrijthof square in Maastricht. Many thanks to Hotel DuCasque for this service. Since November 2018 café/restaurant “Piepenhoes” added another webcam overlooking the river Meuse, their own outside terrace along the river, and the ancient Servaes Bridge. Images of this webcam are on the same page. Location of visitors who ever visited this website. 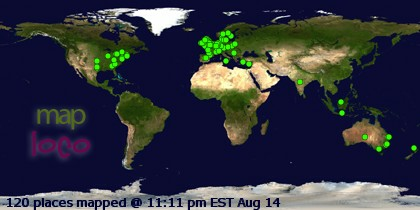 Click on the maps to see where our visitors come from. Important message for the fans about FAKE RIEUS. Currently a few fake Rieus are misleading the fans on Facebook, Twitter, Instagram, Pinterest. Be sure that the real André Rieu never writes messages to fans on Facebook, via PM or otherwise. He’ll never ask for money or whatever. He has no adopted son, he does not announce concerts or Meet and Greets on Facebook. The right information can be found on his official website: www.andrerieu.com. So please report and block these fake persons. Instruction how to do that, click HERE. February, 2019. Love in Maastricht is the title of the new Maastricht open-air concert DVD of 2018. To be released on March 22, 2019. February 13, 2019. For the 4th time André performed prior to the Champions League Ajax’s home game: Ajax- Real Madrid, in the Johan Cruyff ArenA in Amsterdam. Click on the picture to watch the video. Lancashire Post, January 11, 2019. By Clare Kelly. Is André Rieu's orchestra key to a more peaceful world?? Very regrettably, 2019 seems to be starting off with so many disputes, wars, disagreements, famine, divisions and anger which politicians and others appear incapable of solving. One has only to look at Republicans versus Democrats in the US, the EU verses the UK, Russia versus Ukraine, Saudi Arabia versus Yemen, unions versus the private rail companies and many, many more. But there is a way tensions might be calmed. The amazing Dutch violinist and conductor of the Johann Strauss Orchestra, Andre Rieu, has, for 31 years, led his wonderful band all over the world. His orchestra contains folk from 13 different countries. There is never a row, no in-fighting, all successfully based on fun. Wherever his orchestra plays, everyone is full of happiness, goodwill, caring and love of their fellow man. After two or more hours of playing, there is hardly a dry eye in the audience. His music appeals to everyone. So, if his orchestra was booked for a two-hour session before all future ‘disputes and meetings’, the overall air would be calmer, far more pleasant, and a ‘nice’ outcome much more likely. Everything else seems to be failing right now - so why not give this a try? March 2019. Ruud and Ineke attended one of the Lisbon concerts. Click on the picture to read their report. Ever attended the Maastricht FAN DINNER on the ship? If you will be in Maastricht on Friday July 5, 2019, you may register for the fan dinner. Please click on the photo for more information. April 10, 2019. Lorelei and Kavan Hunt traveled from the UK to Romania to attend one of the concerts in Cluj-Napoca. Click on the picture to read Lorelei’s report. It was the first time that she attended an André concert in her homeland Romania. April 12, 2019. Message by André Rieu Travel: From today new tickets are available for all of the Maastricht concerts, via https://www.andrerieu.com/nl/maastricht- concerten-2019, or book a concert with hotel accommodation or VIP arrangement via André Rieu Travel: https://www.andrerieu.com/nl/travel/maastricht. April 16, 2019. The Notre Dame is damaged by fire, but it will be rebuilt. From André’s Facebook: Deeply shocked by the dramatic images from Paris. We would like to provide our 700 tons of steel, used for the set of Schönbrunn Castle, to help erect the scaffold for the restoration of beautiful Notre-Dame. Bravo André!!! March 24, 2019. Sister Leona 105 years old. Dutch TV “Kruispunt”, Interview with Sister Leona. Click on the picture to watch the interview.